Cat Card another fun one to make. It's time to get out all those scraps again. 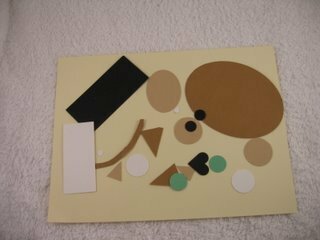 Using whatever paper punches, shop bought shapes or die cuts that you have, make your self lots of different shapes to start. 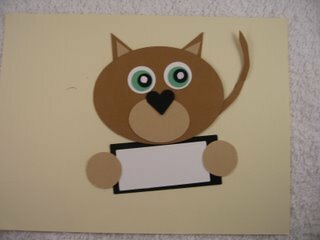 Ovals, circles, heart shapes, all can be used to create these novelty cards. I have used two shades of brown for my card. 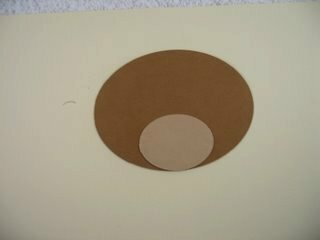 Cut out a large oval in one of the shades. Cut a smaller oval in the other. Cut two medium sized circles for the paws. And hand cut a curved piece for the tail. Layer the smaller oval onto the larger one. It doesn't matter if your oval is larger than the one shown, it can always be trimmed to fit the cats head. 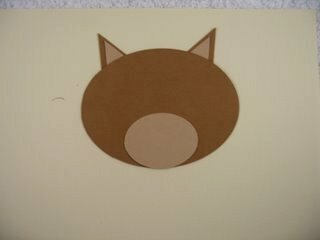 Cut some triangles for the ears in each of the colors and make one set smaller to be the inside of the ears. 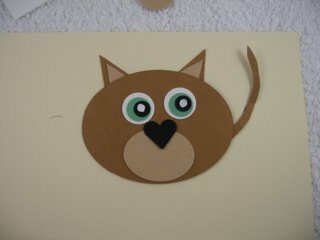 Cut two white circles for the eyes, and two more in whatever color you want your cats eyes to be. Cut two small black circles, then either color the center with a white pen, or add Googly Eyes. I added a small heart shape for the nose. The curved tail is fitted to one side of the cat. The two paws are added to either side of a label for the sentiment. 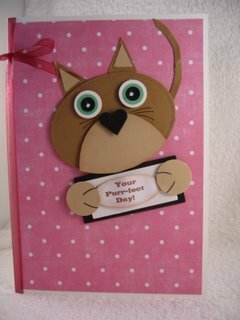 The finished card has had some hand drawn whiskers added, and the sentiment is computer generated and added to the center label. Add small curved lines to the paws. And when you're happy with the way your cat looks then add her to the card. Some pretty backing paper and a ribbon have been added to mine, and it will suit boy or girl. Just have some fun and dress it up any way you want.